With the start of the 2018 baseball season highly anticipated by fans of the sport, here for your reading pleasure is a flashback to the meager roots of perhaps the most illustrious franchise in baseball history. Known as the Baltimore Orioles during the 1901 and 1902 seasons, the franchise went out of business and left their American League brethren much distressed. Ban Johnson, American League President, sought balm for the wound – new ownership for the franchise and relocation to the major market of New York City. Despite his energetic efforts, no takers surfaced as the 1903 season loomed. Enter William Stephen Devery, a former New York City police commissioner, and Frank J. Farrell, a professional gambler. The duo was the last and least of choices as owners. The word was correct that he was skilled in the art and science of collecting “honest graft” in saloons, brothels, betting parlors and gambling dens and dance hall. Protection was a big part of the daily work of those under him. Devery and Farrell were friends, and made millions through their assorted and sordid ventures and services to Tammany Hall. Suppressing his misgivings about Farrell and Devery, Ban Johnson, allowed the pair to purchase on January 9, 1903 the Baltimore franchise for $18,000. With the sale, the new owners were expected to move the team to New York City and build a new ball field for it. On the twelfth day of March 1903, Johnson presided over a press conference announcing that New York City would have a new team in his American League. Owners Frank J. Farrell and William S. Devery were not identified as the new owners; surprisingly, they were not even present. In Albany, a few days later, incorporation of the team took place. Again Frank J. Farrell and William S. Devery were not part of the program. It was no wonder American League President Ban Johnson chose to keep the twosome in the background when and while he could. It was crystal clear they were not the types he sought as owners. But something was better than nothing, and Johnson had not been overwhelmed with ownership offers. That’s how it all started . . .
One of the most prolific and respected sports journalists and oral historians in the United States, author of the autobiographies of legends Nolan Ryan, Tony Dorsett, and Red Holzman, Dr. Harvey Frommer is an expert on the New York Yankees and has arguably written more books, articles and reviews on the New York Yankees than anyone. In 2010, he was honored by the City of New York to serve as historical consultant for the re-imagined old Yankee Stadium site, Heritage Field. A professor for more than two decades in the MALS program at Dartmouth College where he is known as “Dr. 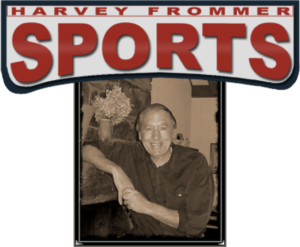 Baseball,” Frommer is the founder of www.HarveyFrommerSports.com.